Deborah Mercer (left) and Leigh Clark whip up batches on mini-donuts for patrons to decorate. Makers Day 2019 at the NJ State Library on Friday, March 22, featured a number of interesting stations, drawing a large crowd of state employees and library visitors. 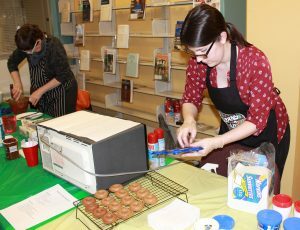 Participants got to make a seed bomb; a popsicle stick shelf; concoct their own spice rub; and decorate mini-donuts. There was a room for a virtual reality experience, and hands-on button making and origami.